We are delighted to announce that our site manager Michael Robinson has won the award for Best Site Manager at the 2017 LABC North and East Yorkshire Building Excellence Awards. 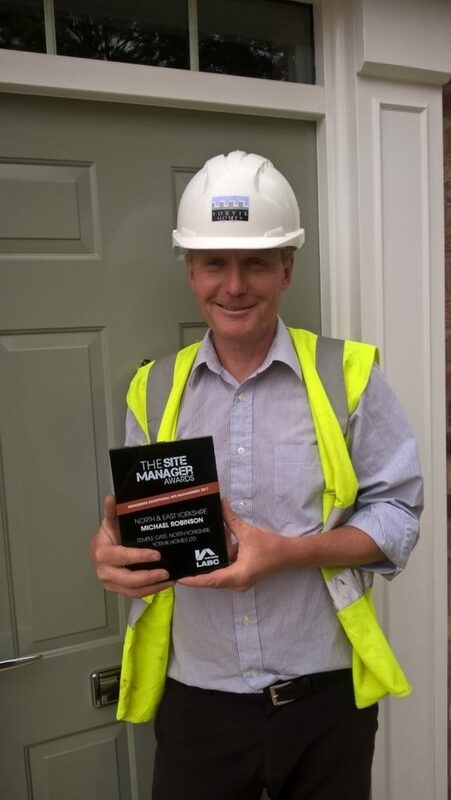 Michael was announced as the winner from a shortlist of three other site managers at a ceremony held in York. Michael joined our team in 2016 having previously worked in the engineering industry. The award recognises his work at our Temple Gate development of 32 homes in Richmond, North Yorkshire. This development posed a number of construction challenges due to its location and uneven ground at the site. The development has been hugely popular with house buyers with only six properties remaining. The 2017 LABC Building Excellence awards are the largest business to business awards in the building control sector. They reward excellent individuals, buildings, outstanding companies, and partnerships that go that extra mile. Nominees are put for the award by LABC Warranty Inspectors who visit the sites twice per week. The judging criteria for the awards looks at elements such as the ability to solve technical problems with creative solutions and the use of innovative products and skills to overcome difficult site conditions. Michael now goes forward to the LABC Grand Finals in London later this year where he will compete against the other nine regional finalists.